Getting ready to put a project on paper can be as easy as 1-2-3. Yeah, right! It’s not so easy putting your project to paper. Most of us don’t outline or write down the ideas we have about our stories beginning, middle and end. Some of us feel it will mess with the creativity of our story. I thought that at first. I’ve been stuck on a project more times than I can count only because I didn’t jot down the important parts of the story arc. So now, to remedy that I work on an outline. I get to know my characters and their personalities. I visited K.M. Weiland’s site and she has some interesting words she has shared in regards to story and structure. I always love to visit her site. She has such great insight on the craft of writing. Her words always guide me and help me to better understand the process of writing. The Secrets of Story Structure, Pt. 1: Why Should Authors Care? What’s the single most overlooked, misunderstood—and yet most important—part of storytelling? If you cheated and looked at the title, you already know the answer is structure. Most uninitiated writers have two different reactions to the idea of story structure. Either they think it’s great, but too mystical and lofty to be understood by common mortals, or they think it’s formulaic hooey that will sap the art right out of their books. I started out somewhere in the “huh?” camp that didn’t even realize there was such a thing as structure. From there, I progressed to reading complicated outlines that left me shaking my head. If that was structure than my story was practically written for me before I even came up with a decent idea. Thanks, but no thanks. What I didn’t know—what most writers don’t know—is that even as I subjected the idea of story structure to ignorance and ridicule, I was actually structuring my stories without even realizing it. In the years since, I’ve been introduced to many theories of structure, all of which bear out the inevitable components found in all good stories, whether their authors deliberately structured them or were just lucky enough to wing it on their own good instincts. Read more here. The story chain is getting geared up! Follow along and read as the story unfolds. Check out all of the blogs that are participating in Deana Barnhart’ s “Gearin’ Up to Get An Agent Blog O Rama” The Neophyte Writer is wrapping up the story so stay tuned! Introduce us to the main character and pick whether you would like the story in 1st person or third. Please tell us what the MC’s goal in life at this point of the story is. Let us know what the MC’s flaw is (the thing he/she tries to work through throughout the story). Fill us in on some back story if you could, but try to weave it in instead of just telling us. Introduce us to a love interest. Write what you want, but show us, don’t tell us about it. Your words are: big toe, Cadillac, baby. Create something that will change the MC’s life. Expand on the thing that will change the MC’s life (from the poster above). Give us some conflicting emotions the MC is dealing with. Callie Kingston – 10AMIs MC’s goal different from before? 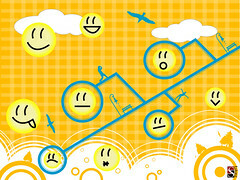 (2nd poster talked about this) If so, tell us what it is now, if the same, give us more info about it. Write what you like, but don’t use any adverbs (ly words) when you do. Nicole Zoltack – 11:30AMGive us a scene with dialog. Weave some back story in (the 5th poster did this also if you want to look at it). This is the middle of the middle of the story. Help the MC gain all the knowledge she needs to take her through the rest of the story. Have the MC interact with someone or something. Have the MC understand something they didn’t before. Take the previous post and continue building tension toward the crisis. This is the crisis point. Give it to us! Give us some subplot closure (the 13th poster started a subplot). I just write where ever or when ever the need hits me. I came across a post over at The Bookshelf Muse featuring author Janet Gurtler on voice and giveaway. This was an interesting read in that, we as writers need to be sure that our characters are getting how they are feeling across to the reader. We want the reader to truly feel what the characters are experiencing. By doing this, our readers become more involved with the story and are easily able to pick their favorite character and follow them throughout the story. To read more about this interview and her novel “I’m Not Her” go here. I loved a good book when I was child. It’s really tough to narrow it down to just one favorite story. Of course, I am just as passionate about Dr. Seuss now as I was then. Green Eggs and Ham comes to mind as being the most read book in my personal library. Another favorite is Where The Wild Things Are, which has now become a movie all these years later. I would say it was the second most read book in my personal library. 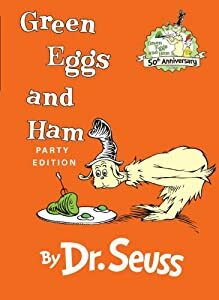 What is it about Green Eggs and Ham all these years later, that still makes me smile? I think its that the quirky little characters that played their role in the story were simply unforgettable. It also cracked me up that if the guy had just tried the doggone green eggs and ham in the first place he might have discovered that they weren’t so bad early on in the story and they could have just gone on to do other things. But that would not have made the story as much fun. I used Green Eggs and Ham with my own kids as a weapon. I would refer back to the story so they would at least try to eat the broccoli or the peas I put on their plates at dinner time. It worked every time. And at night I would make up my own friendly monster stories in reference to Where the Wild Things Are. It would always help get them to sleep at night. I have since purchased those favorite stories for all the little relatives I have in my family. I have even acquired a few new ones over the years and share those with the kids even today. Sharing old and new stories will continue to be a favorite pastime until the day I die. What were some of your favorite stories? What kids stories do you love now?